Buildings are increasingly ‘dynamic’: equipped with sensors, actuators and controllers, they ‘self-adjust’ in response to changes in the external and internal environments and patterns of use. Building Dynamics asks how this change manifests itself and what it means for architecture as buildings weather, programs change, envelopes adapt, interiors are reconfigured, systems replaced. 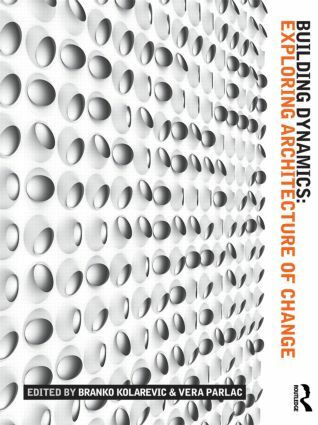 Contributors including Chuck Hoberman, Robert Kronenburg, David Leatherbarrow, Kas Oosterhuis, Enric Ruiz-Geli, and many others explore the changes buildings undergo – and the scale and speed at which these occur – examining which changes are necessary, useful, desirable, and possible. The first book to offer a coherent, comprehensive approach to this topic, it draws together arguments previously only available in scattered form. Featuring the latest technologies and design approaches used in contemporary practice, the editors provide numerous examples of cutting-edge work from leading designers and engineering firms working today. An essential text for students taking design studio classes or courses in theory or technology at any level, as well as professionals interested in the latest mechatronic technologies and design techniques.